After a relatively slow start to his career, playwright Tennessee Williams struck gold with a series of hits that captivated audiences on both stage and big screen. “Cat on a Hot Tin Roof” is one of those hits. The film adaptation is loaded with Williams’ signature sizzling dialogue and rich, complex characters. A brilliant cast including Elizabeth Taylor, Paul Newman, Burl Ives, and Jack Carson spark this story of fractured relationships, family dysfunction, and the word of the day mendacity. It’s sharp, edgy, and chock full of fiery energy. Williams’ play first hit Broadway in 1955 and it would go on to win the Pulitzer Prize for Drama. The film opened in 1958 and was a big success. Richard Brooks co-wrote and directed the adaptation which (as was usually the case) slightly dulled the edges of the play in order to adhere to the Motion Picture Code. Williams didn’t like the changes, so much so that he often pointed people away from the film version. Many of his plays took from his own tumultuous and contentious life making them deeply personal but sometimes turgid and overblown. Judging the movie on its own merits, I find Brooks’ version to be overflowing with great scenes, a perfectly captured setting, and dialogue that pierces with shards of realism. With the exception of two brief scenes the entire story takes place on a huge family estate in the Mississippi Delta. It places us with the Pollitt family, an assortment of deeply flawed and sometimes contemptible people each with more emotional baggage than any world traveler. The family patriarch is Big Daddy (Ives) who may be struggling with some life-threatening health issues. His two sons and potential heirs each have their own problems. Brick (Newman) is a raging alcoholic who hobbles around on a crutch after breaking his ankle pulling a drunken stunt. His relationship with his wife Maggie (Taylor) is as stormy as the Deep South weather. The other son Cooper (Carson in what turned out to be his final role) is more interested in his inheritance. Spurred on by his manipulative wife Mae (Madeleine Sherwood), Cooper is the quintessential brown-noser who hopes to be first in line for his daddy’s fortune. There are so many complicated family dynamics at work. Brick and Maggie have a cold and bitter relationship that stems from harbored anger and pain. There is clear animosity between the brothers which is often fueled by their boisterous wives. There is also a disconnect between a wealthy and success-driven father and the two sons that simply wanted his love. All of these conflicts and others are woven together to create the stinging, vitriolic fabric that makes up the story. Amazingly the various family angles never conflict and there is almost a twisted poetic quality to the various contentions and quarrels. The story is fantastic but it’s the cast who makes it simmer. Elizabeth Taylor was never more beautiful and her sultry natural beauty and Southern charm is ever-present. Paul Newman is perfect as the angry and closed-off Brick. Surprisingly he was not the first choice. Robert Mitchum, Montgomery Clift, and even Elvis Presley all turned down the role. Carson plays a character type that he was well known for and Sherwood is convincing as the hateful and conniving Mae. But I haven’t even mentioned Judith Anderson who plays Big Daddy’s wife Big Mamma (of course). She lives in a delusional bubble where she pretends everything with her family is okay. Anderson is wonderful and many times she is the glue that binds the various fits of dysfunction we see. Brimming with Southern personality, big but fitting performances, and a script with a bite, “Cat on a Hot Tin Roof” is as mesmerizing today as it was over 50 years ago. Perhaps some of the edge is missing from the Broadway production, but I found it to be a delight. It’s a beautiful cinematic creation that still proudly shows its stage show roots. 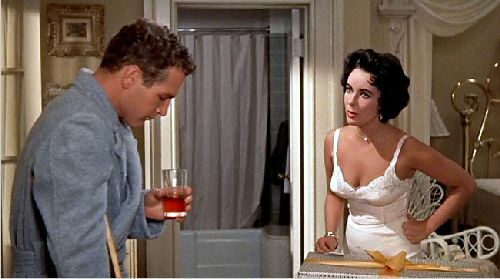 And it only gets better when you consider the phenomenal cast lead by Elizabeth Taylor and Paul Newman. For some it falls short of a more popular Tennessee Williams adaption “A Streetcar Named Desire”. For me this film stands right there with it. This entry was posted in Classic Movie Spotlight, Movie Reviews - C and tagged Burl Ives, Elizabeth Taylor, hot tin roof review, Jack Carson, Judith Anderson, Madeleine Sherwood, paul newman, Richard Brooks. Bookmark the permalink. I’m really glad you decided to feature this one. I must admit to not having watched it in years, but this film was my first exposure to both Elizabeth Taylor and Paul Newman and it was certainly one incredible introduction! ‘There aint nothing more powerful than the odour of mendacity’. Thanks so much Paul! It’s funny, whenever I spotlight a classic my views and comments always go down in numbers. But I insist on it. I am such a huge fan of classic cinema and want to get the word out for those who haven’t seen these films. It’s also a lot of fun talking with fans of them. What a superb cast! Taylor and Newman are magnetic. The movie was originally set to be shot in black-and-white, but when Newman & Taylor were cast the filmmakers knew it had to be in color in order to showcase their good looks. But it isn’t just a cast of pretty people. They pull so much out of their characters. I’m not surprised they chose to film in colour to capitalize on Newman and Taylor, and their famous blue and violet eyes. Both are hugely charismatic but I seem to remember Burl Ives, growing increasingly sweaty and desperate over the duration of the film, being every bit as memorable. I do have a liking for movies that take place in one location for most of the duration (like Rear Window and Sleuth), and even though I’m aware they had to cut some crucial subtext because of The Hays Code, this movie worked for me. Keep up the good work, if only one of your readers enjoys a classic having read your articles then you’ve done your job. You’re exactly right about Ives. His role really picks up in the second half and he knocks it out of the park. I love the whole cast. Jack Carson is great in a variation of a role that he has played many times. Sadly he passed away shortly after making the film. I’m a big fan of Tennessee and this one is right up there. Nothing beats that cast. Oh, how I miss Paul Newman! Nice review, Keith. Thanks Cindy. Great cast indeed and doesn’t this script sizzle? It’s amazing how fluidly it moves from one scene of family dysfunction to another. It unfolds its layers with such poetic precision. It’s amazing thing to watch. Now here’s a film that shows dysfunction in a classy way, so I reckon it makes it less realistic. I am thinking about (oh, shoot, I missed my opportunity for a really great post!) CHTR and August: Osage County. While the acting all around is solid and passionate, there’s something more elegant about CGTR. Maybe it’s the grand setting that makes it seem less crass. Oh that’s a great contrast/comparison. Two films about two splintered and dysfunctional families. One of them I absolutely love and the other I really disliked. “August” hits the same note over and over. It seem like it constantly tried to trump one dysfunction with another. I found practically nothing redeeming about that story and I thought some of the acting (especially from Meryl Streep) was too loud and over-the-top. CHTR was exactly the opposite. To be honest I felt it was more grounded in reality mainly because it had a much stronger focus. I’m a fan of Williams’, and because he warned people off of this film that’s one reason I haven’t seen it. I’m sure it’s still a fine film, but I get why he would be mad as well. I think I read somewhere that once Newman was aware of all the thematic changes, he wanted to drop out of the film but couldn’t. I think with Streetcar they added some scenes back in later…. is that case here as well? He did indeed add scenes back to “Streetcar” but I don’t think that’s the case here. Williams’ objections came after reading the original script and I don’t think any extra scenes outside of that were shot. I definitely understand his creative pride, but I really think he overreacted on this one. Williams knew the Hays Code and how it worked. He had to have known some of the things he wanted simply wouldn’t fly. One omission that he was angry about is actually alluded to in a very crafty way that causes the audience to think more than if it had been tossed out there like Williams wanted. The only part that I do find intriguing is how Williams would’ve preferred the ending. Obviously I think it’s a great film. For me it captures all of Williams’ strengths. It also features an incredible cast that handle the great script with ease. Hopefully you’ll get a chance to check it out sometimes. I would love to hear your reaction to it. I actually have a review already written for “Streetcar”. I may post it this week as well. Not sure. It’s definitely one you should see. LOL!!!!! I guess I can see Brando as young and hunky. I’ll be honest, his performance in “Streetcar” is the one I point to whenever there is a discussion about Brando’s greatness. And the funny thing is he is the only one of that main cast that didn’t win an Oscar. Not seen this Keith but it’s one of my mum’s favourites! Sure Paul Newman has something to do with that! Another classic I need to see! Definitely search this one out. It’s a true classic and it is definitely one that deserves to be seen. I really think you would like it as a movie fan. Love this movie. That cast, man. It doesn’t get better than that. Great review. Great to hear someone else really loves it too. You’re exactly right. That cast is phenomenal. The script is brilliant and watching it in the hands of those great talents never gets old. Excellent post, this is going on my watchlist this instant. Oh that’s great to hear. These classic reviews don’t get a lot of looks but if I can introduce them to just one fellow movie fan it was well worth posting. This is a fantastic movie and I hope you’ll come back and share your thoughts after you see it. One of those classics I have never seen…although I have marked off quite a lot these last couple of years this one is still on it. Oh you really need to check this one out. Great cast, cool story, and one of the most clever production designs you’ll find. It’s my favorite of Hitch’s movies. Are you a Hitchcock fan? No, no, no! It isn’t! I was replying to comments from my phone app and thought you were replying to an entirely different post. My apologies. No this film isn’t directed by Hitchcock. Still, it’s one you definitely need to see. Performances are top notch and the screenplay is just incredible. Hopefully you’ll get a chance to check it out soon. I only watched this for the first time a couple of years back, a real classic. I haven’t actually seen many of Elizabeth Taylor’s performances but she is fantastic here. Nice review Keith! That’s great to hear. I just love it when people enjoy the classics. Taylor absolutely owns her role. But then again the entire cast is brilliant and they handle the razor-sharp script perfectly. Really glad to hear you loved it too. Burl Ives is someone I enjoy watching too. Yes indeed. I always remember Burl Ives as the voice of Sam the Snowman on the TV version of Rudolph the Red-Nosed Reindeer! This is a considerably different role. Great review! Haven’t watched this in a long time. Thanks! It’s a true classic in my book.